Theatrical institution ArtsEd has received planning permission from London Borough of Hounslow for the reorganisation and refurbishment of its west London home, Cone Ripman House, to create a new studio theatre, as well as additional rehearsal and teaching spaces. This will make use of the tight urban site, optimising the existing buildings and unlocking the potential of its currently empty space, whilst maintaining a positive contribution to the wider conservation area and community, as well as the school’s immediate neighbours. The project will cover all aspects of ArtsEd’s provision and will see significant improvements in the facilities of the Day School and Sixth Form as well as the Schools of Acting and Musical Theatre. 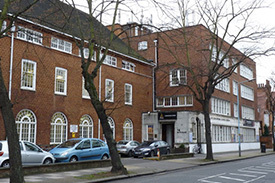 ArtsEd was built as Chiswick Polytechnic in the 1950s and adapted for the schools’ use over thirty years ago. Today, Cone Ripman House is set to be redeveloped to create facilities that reflect ArtsEd’s reputation for world-class conservatoire training. This major refurbishment of ArtsEd’s west London home will provide students with world-class facilities in an inspiring environment, including a new state-of-the-art Studio Theatre. This will complement the Andrew Lloyd Webber Foundation Theatre which opened in 2013. ArtsEd will also be able to share these new facilities with the wider community through its continuing programme of courses. ArtsEd is one of the UK’s leading drama schools, offering outstanding conservatoire training on its three-year BA Hons courses in Acting or Musical Theatre. Its reputation as a centre for excellence lies in the industry-focused expertise and calibre of staff, its intensive and practical training schedule, and strong focus on pastoral care.